The first steps towards this goal have already been taken, in the form of the major new public works that began just as the boom ended and either have or are reaching completion now. Thanks to these, Málaga now boasts an impressive new airport terminal with transit capacity to match, a new ring road that alleviates congestion at former choke points near the city’s periphery and allows for easy routes to surrounding cities, and a high-speed rail link to Madrid that culminates in a brand new purpose-built railway station and commercial centre. In addition, work has begun on the initial part of a future metro network. Added to a hardworking port with new and growing cruise terminal facilities, an expanding variety of high standing cultural options and a sizeable technology park that has been functioning for some time now, it is an impressive list by any city’s standards, yet this is only the beginning. The truth is, Málaga is developing at a time when you would least expect it, and in the process the city is putting down foundations for a future prosperity that is built on a greater degree of economic diversification. In other words, while tourism continues to be developed and is in fact thriving in the city at this point in time, the master plan for Málaga and the surrounding region very much focuses on the creation of a competitive advantage in other fields as well. 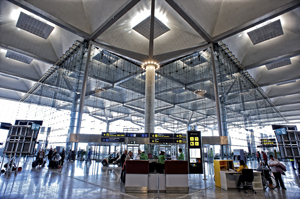 The city’s airport is, perhaps surprisingly, one of the oldest in Spain, having been created as part of a network that linked a range of cities in France, Spain and former French Morocco. In those days the service was run by the Générale Aéropostale company, one of the earliest airlines in the world and the brainchild of aviation pioneer and aircraft designer Pierre-Georges Latécoère. The erstwhile airfield was little more than an aerodrome, and it remained pretty much like that until being upgraded in the 1960s, when overseas tourists started arriving in numbers. Today’s old terminal originated in 1968, added to by the Pablo Picasso Terminal in 1990, and the brand new Terminal 3 that became operational in 2010. Last year almost 13 million passengers arriving from over 60 countries passed through the airport’s gates, making it the third busiest in Spain. A second runway, to be opened in May this year, will add significantly to Málaga’s passenger capacity, and with terminal three’s shopping facilities, a new seven-storey car park capable of holding 2,500 cars and a second fire brigade centre the facilities are now of an internationally impressive standard. It sets the tone not only for a potential increase in tourist numbers but also provides that all-important link to the outside world that every major business centre needs. If Málaga is well served by air links it has also worked hard to ensure that there are good rail connections to the rest of Spain, and Madrid in particular. Decisions made on a European level have frustrated the desire to extend the coastal rail connection to Marbella, for now, but the desire to link Málaga not just with Marbella but all the way to Algeciras remains strong. Such plans are on hold for the time being, but the high-speed AVE rail link has been a reality for over four years now, linking the Costa del Sol to the Spanish capital in well under three hours. Since its launch in December 2007, some 7.6 million people have travelled to Madrid this way, accounting for around 75 per cent of traffic on this prime business route. Although the rate of growth is now slowly levelling off, the AVE has reversed the ratio of aeroplane to rail users in four years, indicating just how important this service is especially to business travellers. With the AVE, Málaga got not just a high-speed connection to the nation’s commercial heart, but also a state-of-the-art railway station that doubles as an important commercial centre. Situated both near the city centre and the port, the Estación Maria Zambrano is another vital component in the plan to make this region an international business node. Named after a famous poet, it features state-of-the-art rail travel infrastructure and facilities, including one of the largest shopping centres and food courts of any railway station in the country. “The new station has been designed to offer the highest standards of rail and commercial services,” says Antonio López Romero, Press Officer of ADIF, the company that administers Spain’s railway hardware, “but also with economic and environmental sustainability in mind. What’s more, the station had to integrate into its urban setting and offer a range of services that are complimentary to its immediate surroundings.” It’s a demanding brief but also a good way to get value for money out of well thought-out projects, and indeed, more than simply adding another modern structure to the cityscape, the Maria Zambrano has become a successful commercial venture in its own right, used by over four million travellers and visited by over 16 million shoppers in 2011. They are drawn by facilities that include a hotel, restaurants, cinema and a broad variety of shops, as well as services focusing specifically on rail travel, and together these functions have brought a healthy amount of new employment to this part of the city, yet above all the importance of this new facility is the possibilities it offers. “The station acts as a central transport hub in the city that connects the airport, road links, taxis, busses and in the near future the underground metro system, functioning as a fine example of a 21st century transport network,” says Antonio. “An infrastructure of this kind is in itself no guarantee of further economic development, but in the modern world it is hard to compete without it.” In other words, areas with this level of facilities and solutions in terms of transport and logistics are in an ideal position to attract foreign investment and entice international corporations to establish operations here. The final component in terms of linking Málaga to the outside world is the port. As an ancient harbour city with a heritage dating back beyond Roman times to the Phoenicians, Málaga was long a typical southern seaside town but is now increasingly becoming an important modern entrepôt in this part of the Mediterranean. It may not be the biggest port on Spain’s Mediterranean coastline, that honour goes to Valencia, but it has invested heavily in modernising its nine quays and the related loading and logistical facilities, resulting in an increasingly efficient and competitive harbour operation. This development in the commercial port has been largely overshadowed by the rapid growth that has seen Málaga become one of the leading cruise destinations in Europe. A large proportion of Mediterranean cruises now stop here, resulting in over 200,000 visitors disembarking every year from over 200 ships. It has coincided nicely with the beautification process of the city centre and given tourism in Málaga an important boost. Moreover, figures are still on the rise and the continued strong demand has led to the development of more and improved facilities, including a new passenger terminal and the conversion of a formerly underutilised quayside into a highly attractive centre where visitors and locals alike can shop, dine, relax and enjoy cultural and commercial events. As such it links up beautifully with the existing parks and plazas of the newly rejuvenated city centre, integrating it with the buoyant cruise section of the port. Instead of disembarking in an industrial harbour environment, therefore, visitors now enter Málaga via a brand new terminal building and step on to the Muelle. “The first thing they see is Muelle Uno, and it’s a vast improvement on the old concrete dockside and dilapidated warehouses that were there before.” Indeed, though modern and attractive in its styling, the Muelle Uno project has been realised with a minimum of visual impact, almost as if it were carved into an existing embankment. In spite of such restrictions the demand for commercial space here is strong, and as a result of them the architectural integrity of the complex is safe and its role as a public leisure and cultural centre respected. The rejection of supermarkets, certain types of shops, fast food outlets and bars forms part of this philosophy, as the operators consciously want to prevent it from becoming either a drinking alley for youngsters, a low-rent destination or even an exclusively upmarket one. The result is 53,000m2 of leisure space with 5,000m2 of commercial space, marked by attractive modern styling, trendy outdoor eateries and lounge-style cafés, park areas, children’s playgrounds and a variety of venues and settings in which cultural and corporate events can be held, and entertainment varying from live music to fashion shows, arts fairs and outdoor car shows is offered. “The Muelle is a pleasant first point of contact for visitors coming off the cruise ships,” says Patricio, “and it can act as a home base for them as they set out to explore the city. 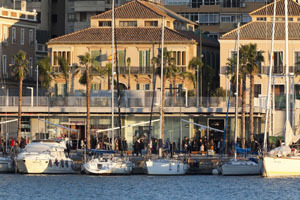 However, although such visitors form a very important part of our clientele the complex is also very much intended for the local population.” So far this is exactly what has happened, with crowds flocking here to linger in a sunny quayside setting overlooking the port, the city and the new marina lined with visiting super yachts. Launched and successfully operating in the current climate, such ventures are a reflection of the renewed vigour and refinement of Málaga, and the commercial and technical know-how it is increasingly capable of displaying. They act together with a sound infrastructure, an inviting quality of life and an available pool of qualified labour to attract big players, both foreign and national, to these parts. At the heart of the plan to develop Málaga into a technology centre of international standing is the creation of the ‘Málaga Technology Valley’, envisaged as an important concentration of technology-based firms. Some might consider it to be ‘pie in the sky’, but in reality it has been in existence for almost 20 years now, in the form of the Parque Tecnológico de Andalucía. 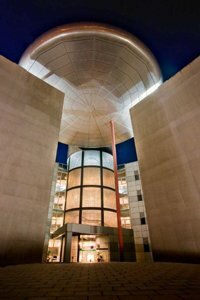 Originally developed in collaboration with the University of Málaga, the city’s technology park has grown steadily to become a pretty impressive centre of manufacturing, advanced services and R&D that houses around 1000 companies. While many of these are small software and IT outfits, as well as professional consultancies, there are also major blue chip companies, including large solar panel manufacturers, rail engineering firms such as Adif, Alstom and Siemens, and the likes of Fujitsu, Huawei, Air Liquide, Ericsson and Oracle, some of which employ a thousand people or more. It is exactly this kind of multinational corporation that the local authorities are looking to attract in growing numbers, to effectively turn the Málaga Technology Park into the Málaga Technology Valley. At the heart of this is the switch from merely setting up branches that service the local market to establishing production and research centres that serve a wide area and export their output. To this end the park is designed with growth in mind, offering not just office space but also logistical support, incentives, a trained labour pool, transport solutions for staff and a great living environment for those who set up shop here. If the technology park is the physical embodiment of this ambition, then the Club Málaga Valley initiative – a think tank of leading national and international business and technology impresarios – is its spiritual equivalent, meeting regularly to promote new ideas, initiatives and incentives to help realise the creation of a true 21st century Málaga Technology Valley. The fact that the city’s town hall has also embraced the Málaga Valley concept is an indication of just how serious the local authorities are in their desire to create a newly diversified and sustainable model for employment and economic growth in the region. This entry was posted on Thursday, June 7th, 2012 at 3:39 pm	and is filed under Business and technology, Environment, Freelance Writing, General Interest, Social Issues, Travel. You can follow any responses to this entry through the RSS 2.0 feed. Both comments and pings are currently closed.